Governor Banwarilal Purohit, I am angered and agitated. You didn't answer my questions, but you decided to patronisingly, and without my consent, pat on my cheek as a reply. To you, it might be a mark of appreciation, and a "grandfatherly" gesture, as you replied to several questions during the hour-long press conference on sexual allegations against you. But to me, it was an uninvited gesture as I wanted only answers and not a pat on my cheek. It was a day of news reports on the professor Nirmala Devi issue. As a journalist, I too wrote on the politics and the controversies surrounding the case. And, when there was a press communique from the governor's office saying he will meet the press at 6 pm, I too set out with our Manorama TV crew to pose a few questions to Banwarilal Purohit on the issue. I was sitting right on the first row throughout the press conference. I had three to four questions to him over allegations of sexual misconduct, and the reports over a home ministry enquiry against Banwarilal Purohit. To these, he replied with much anger, dubbing them, “nonsense and baseless allegation." 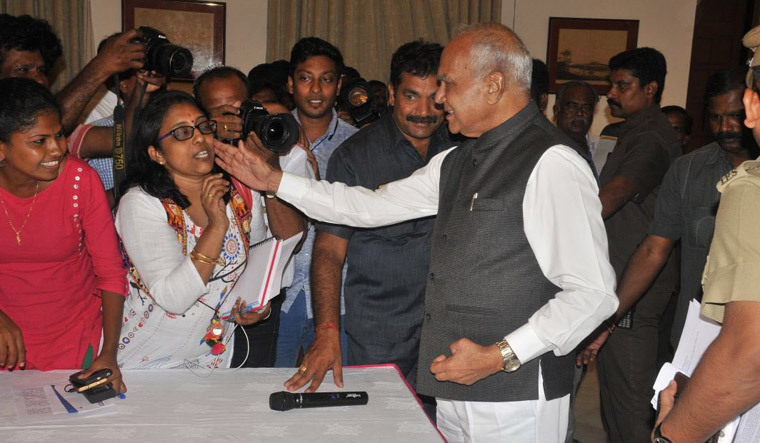 The press conference went on and there were so many questions on the allegations surrounding Raj Bhavan, and his excellency Governor Banwarilal Purohit himself. When a scribe asked him if he should appoint a committee when the professor, in her recorded audio conversation, drops his name, his face turned red, and all that he said was, “I haven't even seen her face." During the entire press conference, it seemed that Banwarilal Purohit wanted to reiterate the fact that he is the highest authority of the state as per constitution. To questions on his authority to appoint the one-man committee under retired IAS officer R. Santhanam, he said he has acted as per the existing guidelines under Universities Act. The press conference was almost over. And when he got up from his chair, a TV reporter quickly managed to grab his attention and asked him about how much progress he had in learning Tamil. Purohit had earlier spoke about his interest in learning the language. He was happy to answer the question. “Thamizh oru inimaiyana mozhi (Tamil is a very sweet language),” he said. I was standing next to him. "Who is your Tamil teacher,” I asked him. Standing next to me was my friend Lavanya Natarajan of News 7, who also had the same question. Banwarilal Purohit didn't reply, but moved a step forward. My next question to him was the one that he had refuse to answer earlier. “Sir, you said you are satisfied with the government's performance. Are you satisfied when it comes to the performance of universities too,” I asked him. He didn't hear me at all. Instead, he patted on my left cheek and got away. It was a crowded press conference, and I was transfixed for a moment by that gesture. Lavanya tried to console me. I rushed to the washroom and washed my face several times. When I narrated my ordeal on Twitter, many trolled me. But there were many who supported me too. And I sincerely thank them. I want to say, yes I am agitated. Many may ask me to dismiss the entire episode saying, 'may be, this was a pat of appreciation' or 'a grandfatherly gesture'. But to me, Banwarilal Purohit is the governor of a state, and I am a journalist whose responsibility is to ask the right questions. I expect answers, not a pat on my cheek. An act like this moments after he dismissed a barrage of questions about allegations of sexual misconduct against him, to me, is unprofessional behaviour. And, it is completely uncalled for to touch a stranger—a woman—without her consent.